What sets Calculated Risk apart from other dealership management companies? First of all, there aren’t many dealership management groups. One of the primary differences is that we invest in our people more than others. Another important difference is that we are business people first, and motorcycle enthusiasts second. What is your strategy for attracting and keeping the top sales and service talent in your stores? We train our team members well enough that they can leave but we treat them so well that they don’t want to. Our team members become our recruiters for the company. How does Calculated Risk’s Talent Development program differ from those of other dealerships/dealership groups? Ninety-nine percent of motorcycle dealerships simply have no Talent Development program. Most dealerships accept employee turnover and simply look to constantly backfill the funnel. Click here to see our Talent Development. We pay attention to markets and trends and attract talent that understands our culture. We also make a plan and execute that plan with imagination and creativity. How do you see yourself helping other dealers grow their businesses? Helping dealers become owners. The first step is to stop being an operator of a store and start being a manager of operators. I’ll be most proud when I have created ten millionaires. Two down, eight to go. What was your favorite bike ride? One of my favorites is riding in the Colorado mountains. But it’s more of a feeling, than a location, that makes it the best ride. Biking the Colorado mountain roads is a feeling that’s different from any others. Staying ahead of it instead of chasing it. What made you expand from specifically your Harley-Davidson dealerships into used bikes with Lucky Penny? Seventy percent of all motorcycles are sold outside of the dealer network. There is a huge population of buyers who don’t want to deal with a dealership. They just want a used bike at a fair price from a reputable dealer. That is what Lucky Penny offers. What future growth plans do you have for Calculated Risk? Our next steps are to increase the number of Lucky Penny stores. How do you describe the Calculated Risk brand? Commitment to our team members and creating exceptional customer experiences. The Calculated Risk team is always tweaking our business model to improve these two standards. You have a large collection of vintage Harley-Davidsons. Which is your favorite? My favorite is a 1936 Knucklehead. I’ve had it a long time, restored it twice and will never sell it. It’s an important bike in Harley-Davidson history. It was the last bike the four founders were involved in designing. My first bike was a Honda Z50 dirt bike. I was about 6 years old when I had it and I rode the crap out of it. So much so that my knees rubbed the paint off the gas tank. What was your first job? How did that set the course for your success with Harley-Davidson? My first real job was at age 15 selling bicycles at a bike shop that was just across the street from the current Texas Harley-Davidson location. I was heavily into bicycling at the time but the guy who owned the shop wasn’t hiring. I offered to work for free for a Saturday on the condition that he hire me if I did well. I sold five bikes my first day on the job, got hired and worked there two years. My dad owned a H-D dealership at the time. I asked him how much he sold his bikes for. He said $16,000. He asked me how much mine sold for. I said $500. I realized if I am going to sell something, it might as well be a higher priced bike so I started selling Harleys at age 17. 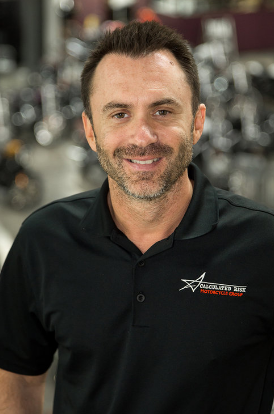 What do you hope to accomplish as 2018 president of Harley-Davidson’s Dealer Advisory Council? Harley-Davidson and the powersports industry are going through a challenging time. The Dealer Advisory Council members and I will work hard on behalf of Harley-Davidson dealers to improve working relationships with Harley-Davidson Motor Company.